“No problem,” I think, and continue on my merry way. Perhaps this is a good time to tell you that one of my secret talents (okay, my only secret talent) is parallel parking in tight spaces. And this isn’t even parallel parking, so it’s a piece of cake for me. Twenty seconds later my car is parked, surrounded by empty spaces. I turn off the engine and open the door. “Park again and straighten out,” the attendant calls to me. How strange. 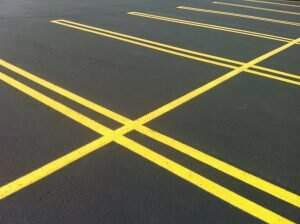 I thought I was between the lines. While driving to my medical appointment, I had been in the midst of an upsetting phone conversation with a friend about a child close to me. Perhaps I was distracted. So I get back in the car and park again. I turn off the engine again and get out of the car to examine my work. Yep, between the lines. Nope, not even touching the lines. Clearly the parking attendant’s standard was different from mine. He wanted to see Perfection. Perhaps he had a top Need that wasn’t getting met in other aspects of his life, and so he started emotionally leaking at work. I’m just speculating, of course. I, on the other hand, was going for Good Enough. Between the yellow lines, without touching them, without anyone or anything trapped under the car, is good enough. Here comes the point. When you have a lot happening in life and work, and no one’s safety is at risk, go for Good Enough. Perfection is the enemy of progress. I’d rather get a lot done well, and safely, than get one thing done perfectly. What’s one thing you’ve done well enough lately? Please share it in the comments below. Can’t think of anything you’ve completed imperfectly? Oh, honey, we need to talk. I agree I've had to let go of a lot lately due to living with someone who is disabled, I feel liberated to realize I can live with incomplete almost there and next time– I'm more in the moment than ever. Hooray for you, for being more in the moment than ever! Great post. I would completely forget about the parking and be thankful I made it to a medical appt for myself. Just scheduling one is a major accomplishment, let alone getting there. My mom-in-law calls guys like that "Little Napoleons." They have this tiny bit of power of you and they lord it over you and treat you poorly–because in truth they feel small and weak. Sad, really. I wonder how many times a day he pulls that garbage! Glad you told him off! I'm quite sure I had no effect on this Little Napoleon. But he sure had an effect on me! I've been imperfect in so many ways my whole life. Once someone expects perfection, its time to move on! Funny story, Debra. Perfection is overrated, it traps you in the never ending cycle of never completing anything and never accomplishing your goals. No matter how good a job you did, something can always be changed, perfected. Too, our standards do not always line up with other's standards and so we could continue to tweak something depending on who critiqued it and their own standards. Thanks for the reminder that sometimes, you just have to move on. “Sometimes you just have to move on” – so true! I parked there for half an hour, went home and wrote my blog post, and let it go! I’m so glad it’s benefitted others by bringing laughter. I had to laugh at the ridiculousness of the situation. Perfection is not a good goal in my opinion. Very few things require it. Good enough works. And it gets something done. Hurray for those of us who willingly and joyfully accept imperfection. Agreed! I just had a phone call from a client who asked if this situation was really true. THAT’s how ridiculous it was!